Review of: Play Li'l Red Online Slot Machine by WMS at Slotorama! The story of little red riding hood comes alive in the 10-reel, 100-line Li'l Red online slot by WMS! Build the courage to venture through a darkened forest, pursued by the big bad wolf and make it to Granny's house where big fortunes await. Filled with bonus features, you can win huge rewards on the Colossal Reels with stacked wilds, free spins and multipliers that offer a rewarding 95.94% RTP. 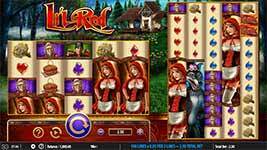 The story of little red riding hood comes alive in the 10-reel, 100-line Li’l Red online slot by WMS! Build the courage to venture through a darkened forest, pursued by the big bad wolf and make it to Granny’s house where big fortunes await. Filled with bonus features, you can win huge rewards on the Colossal Reels with stacked wilds, free spins and multipliers that offer a rewarding 95.94% RTP. Stacked Wilds – The Wild symbol is wild for all symbols except the bonus and will substitute to complete wins when possible. Any four stacked Wilds appearing on the main reel set starts a symbol transfer, turning the corresponding reel on the Colossal Reel Set into Wild. All pays are evaluated after Wild transfers. Free Spins Bonus – Land three or more bonus symbols scattered on the reels to trigger the free spins bonus round. Bonus only appears on reels 1, 3 and 5 of the main & colossal reel sets. You can win up to 20 free spins with up to a 20x multiplier on all free spins wins! If one or more wilds from a stack appears on the main reel set, the rest of the stack will nudge into place, making all four reel positions on the reel wild. The wild will then transfer over to the Colossal Reels, making the corresponding reel wild.